A curated project by Gallery Wendi Norris for Equal Pay Day 2018 in partnership with Hired; artwork by Val Britton. SAN FRANCISCO -- March 27, 2018 -- In honor of Equal Pay Day 2018, Gallery Wendi Norris has partnered with Hired, a career marketplace that matches tech talent with the world’s most innovative companies, to present a curated project that will foster creative problem solving and dialogue around wage inequality. 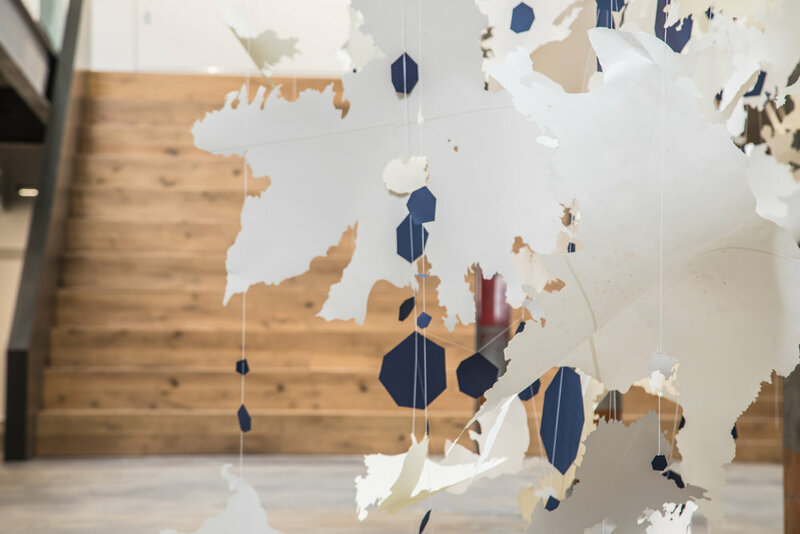 The Shape of Change presents a commissioned body of work by San Francisco-based artist Val Britton, curated in direct response to Hired’s 2018 report, The State of Wage Inequality in the Workplace, which calculates current trends in tech salaries. Last year's data found that 63% of the time, women received lower salary offers than men for the same job at the same company — and the forthcoming report will further evaluate the state of wage inequality today between men and women in the technology field. 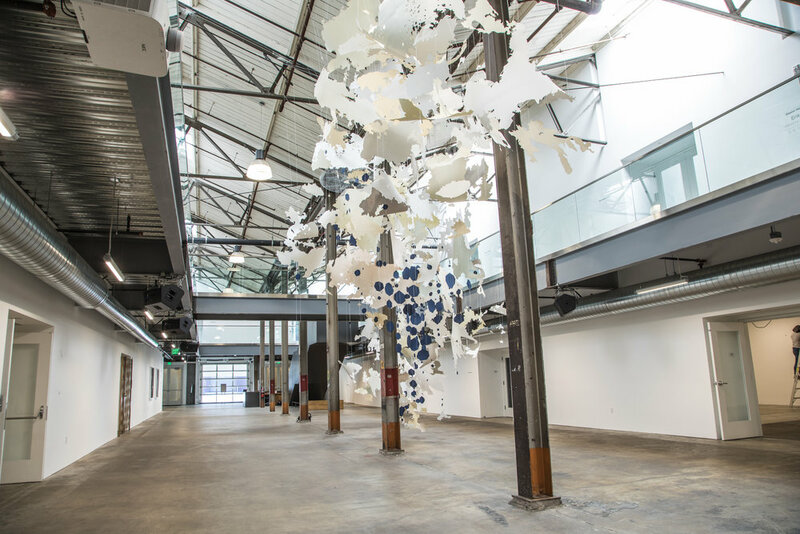 The installation will transform the atrium at Minnesota Street Project with two mixed media paintings on paper and a sculptural installation made up of cut paper and string. The work stems from Britton’s interpretation of the statistical analyses that become transmuted into visual elements, i.e. shapes, forms, and colors. She extracts ratios and statistics from the report to be converted into concrete masses. These abstract, geometric visual elements are imbued with Hired’s report data, yet remain open for audiences to explore a multitude of potential meanings. It will be on display April 9 - 14. Coinciding with Equal Pay Day on April 10, 2018, The Shape of Change shines a light on the state of wage inequality across the technology industry. Gallery Wendi Norris selected Minnesota Street Project, a prominent art space in San Francisco, as the site for the installation in the interest of collaborating with the local arts community, and bringing this important campaign to a space that has developed its mission around supporting the arts and artists in the Bay Area.